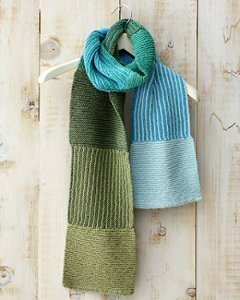 This beautiful open weave scarf from Authentic Knitting Board is knit with (2) strips for a wide version or a single strip for narrow accent. Shown with (2) strips sewn together. Each strip is knit at full width of mini board or (22) needles. Berroco Jewel FX Enchantment yarn for accent (1) skein. The glitter yarn is used randomly as stripes throughout the shawl/scarf. When adding a stripe, tie on glitter yarn and cut main yarn with 3-4” tails. These tails will remain and do not get pulled into knitting. Do the glitter stripe in one row each time it is used. Stripes are most effective if used after every 2-3-4 rows of main yarn. Always allow the tails of the glitter yarn to flow at outer edges. Use 4” bolts and spacer at widest spacing or 1-1/4”. Finished Size is aprox 14” X 60” each strip. Completely knit in Stockinette Stitch. Cast on 22 Stitches with Cotton yarn. Place anchor yarn. Knit (3) rows. Cut yarn with 3” tail. Tie in Glitter yarn leaving 3-4” tail. These tails are not pulled into knitting, but left out at edges for effect. Knit (1) row with glitter yarn. Cut, knot. Tie in Cotton yarn. Do this stripe of glitter every 3-4-5 rows for a random effect of color and texture. Total rows of knitting=102 rows or 50-60 inches. Bind off in Cotton Yarn. Wide scarf-Knit the 2nd strip. Sew the lengthwise edges of both strips with cotton yarn and create a knot at each stitch, without cutting. The yarn joining these pieces will be loose and unnoticeable while the knot will hold it securely. Fringe: Cut both yarns in 13” length of strands. Use 12 fringes on each end of strip of (3) strands each. (2) of one yarn and (1) of the other. Alternate. Fold yarns and pull folded end thru edge stitch of scarf strip. They should be aprox 1” apart. Leave the fringe untrimmed, as your uneven edge will add a warm, fun flair to the look. It’s ready to wear.